Lesson 15 - What is Hell? 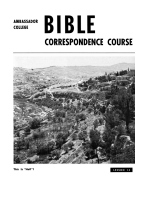 Our cover shows the Valley of Hinnom, located just outside of Jerusalem. The Greek word Gehenna — translated "hell" in the New Testament — refers to the Valley of Hinnom. It was here that the refuse of the city of Jerusalem and the dead bodies of criminals were thrown to be burned. Jesus referred to these fires when He spoke of the destruction of the incorrigible wicked! SHOCKING as it may seem, you may go to "hell"! Many of your loved ones are right now in "hell"! You probably never heard the TRUTH about what "hell" really is — and where all of your ideas on the subject came from in the first place. You probably just accepted, without question, this world's idea of a horrifying, nightmarish place of never-ending torture for lost sinners. It's time we quit "swallowing" the ideas and theories of confused humanity, and begin STUDYING the truth for ourselves in God's Word! "As generally understood, hell is the abode of evil spirits; the infernal regions... whither lost and condemned souls go after death to suffer indescribable torments and eternal punishment.... Some have thought of it as the place created by the Deity, where He punishes, with inconceivable severity, and through all eternity, the souls of those who through unbelief or through the worship of false gods have angered Him. It is the place of divine revenge, untempered, NEVER ENDING. This has been the idea most generally held by Christians, Catholics, and Protestants alike. It is also the idea embodied in the Mohammedan's conception." The Encyclopedia Americana states: "The main features of hell as conceived by Hindu, Persian, Egyptian, Grecian, and Christian theologians are essentially the same." The Western religious leaders through the Middle Ages borrowed the doctrine of eternal torture FROM THE PAGAN PHILOSOPHERS. Certain of these writers of the Middle Ages had such tremendous influence on the Christian-professing world, that their writings and teachings came to be generally accepted and believed, until it became the doctrine of the Christian-professing world. Among these influential writers were Augustine (345-430 A.D.), and Dante Alighieri (1265-1321 A.D.). Dante wrote a tremendously popular book titled, The Divine Comedy, in three parts — Hell, Purgatory, and Paradise. There is another book titled Dante and His Inferno, which sums up the history of the Christian-professing doctrine of hell. Bust of the pagan philosopher, Plato. His writings are the philosophical basis for the modern belief in the immortality of the soul, and the doctrine of a tormenting "hell." — Historical Pictures Service. This factual history says that "of all poets of modern times, Dante Alighieri was, perhaps, the greatest educator. He possibly had a greater influence on the course of civilization than any other man since his day... he wrote, in incomprehensible verse, an imaginative and lurid account of a dismal hell — a long poem containing certain phrases which caught the attention of the world, such as, 'all hope abandon... ye, who enter here!' This had a tremendous impression and influence on the popular Christian thought and teaching. His 'Inferno' was based on Virgil and Plato." Dante is reported to have been so fascinated and enraptured by the ideas and philosophies of PLATO and VIRGIL, who were pagan philosophers, that he believed they were divinely inspired. Here is an article on Virgil, from the Americana: "Virgil, pagan Roman poet, 70-19 B.C., belonged to the national school of pagan Roman thought, influenced by the Greek writers. Christians of the Middle Ages, including Dante, believed he had received some measure of divine inspiration." Plato was a pagan Greek philosopher, born in Athens, 427 B.C., a student of Socrates. He wrote the famous book, Phaedo, on the immortality of the soul, and this book is the real origin of the modern belief in the immortality of the soul. So the world's concept of "hell" is admittedly a product of centuries of man's thinking on the great problem of reward and punishment which man associates with human deeds. It did NOT COME AS A REVELATION FROM GOD, but is rather the product of man's thinking — using human reason to decide what only God can reveal! What About the Millions of Heathen? Now, before we examine to see whether man's idea of hell is true, let us consider where this concept of hell, if true, leads us! On this earth there are more than three billion people! The most populous lands are China, India, and other parts of Asia, and in spite of missionaries from the West, actually more than half of all the people on the earth have never so much as heard the ONLY NAME BY WHICH MEN MAY BE SAVED — the name of JESUS CHRIST! For your Bible says, "... there is none other name under heaven given among men, whereby we must be saved" (Acts 4:12). This means that billions of people here on this earth have lived, and died, without having known anything about Christian salvation — without saving knowledge — neither having heard the only name by which men may be saved! Now think what that means. If all unsaved have gone immediately to hell at death — the hell commonly believed in — then more than HALF the people who have ever lived on this earth have been consigned there without ever having been given so much as a chance to escape it! They are ETERNALLY LOST in tormenting "hell fire"! Can you really believe that is the plan by which an all-wise, all-merciful, loving God is working out His purpose here below? WHAT IS THE TRUTH? We face these alternatives: Either the Holy Bible is the inspired Word of God, by which the Creator reveals the TRUTH on this subject, or else we must fling up our hands and confess we just don't know — we are ignorant on the question — because no one has ever come back from such a hell to tell us about it. We must believe what the Bible says, or we can believe nothing, if we are rational and honest! Is there even such a thing as "hell fire"? What does the Bible say about it? Didn't Jesus say something about "hell fire"? Yes, He did! Is your Bible in front of you? If not, go get your Bible — or Bibles if you have more than one translation. Also have several sheets of paper, and a pen, pencil or typewriter so that you can make notes to help you in remembering what you learn. Remember — you must open your Bible to every passage. Never say to yourself, "Oh, I think I know what the scripture is referring to" — and then pass over it. You need to keep your nose in the Bible, so to speak. You must read and REREAD and STUDY EVERY PASSAGE in your Bible. Don't forget, this is a BIBLE STUDY COURSE — not just a study of these words we send you. This lesson is intended to direct you to the Bible — to help you learn the TRUTH of God's Word. Now with your Bible, a good dictionary, and concordance, if you have one, and your stationery all in front of you, here is the METHOD of study. Write down neatly on your paper the title and underscore it. Next write down the question section heading. Then, underneath, number each question as you proceed. For each question write down the answer, together with any pertinent ideas that may come to your mind. Be sure to WRITE OUT THE SCRIPTURE which answers each question. Writing down the answers, every word of each Bible passage, and any comments you wish to make as you go along — will help you greatly in reviewing and remembering. Christ Spoke of "Hell Fire"
1. What punishment did Christ warn would happen to those who would not QUIT SINNING? Mark 9:43. Did He say they would "go into hell"? And did He say there would be a fire there? Same verse. Then there really is a hell, since Christ says so, isn't there? is "to go into hell, into the fire, " it follows that Christ clearly stated here that those who sin will receive punishment by fire as their ultimate reward. Note that Christ associated the Greek word gehenna with fire. 2. Did Christ, for greater emphasis, repeat, in Mark 9:45, that this punishment by fire would befall those who continue to sin? COMMENT: Mark wrote down the same Greek word gehenna here in verse 45 that he used in verse 43. Those who translated this Greek word into English, when they made the English Bible, selected the English word "hell" to represent this Greek word gehenna. 3. Did Christ repeat a third time, for the greatest emphasis, that anyone who persistently serves sin will receive this punishment by gehenna "fire " — "hell fire"? Verse 47. COMMENT: Again, the Greek word which Mark used in this verse was gehenna. GEHENNA CERTAINLY DOES REFER TO FIRE!! On the use of the word "hell" in the New and Old Testament, let's read what an outstanding Bible Dictionary, called A Dictionary of the Bible edited by James Hastings, a leading authority on such technical matters, says. Keep in mind, as we read his material, that the Old Testament was originally written in the Hebrew language, and that the New Testament was originally written in the Greek language. "The word 'hell' is translated 2. as the equivalent of the Greek word 'tartaros' (II Peter 2:4), [a place of restraint for fallen angels which occurs only once in the Bible] and, 3. as the equivalent of the Greek word 'gehenna' [gehenna-fire punishment]." The original Old Testament Hebrew word "sheol" and the New Testament Greek word "hades" mean the SAME THING — THE GRAVE. These original words have been translated "grave" in many places in the Bible. "Hell" is an old English word, and over 350 years ago, when the Authorized Version was translated, the people of England commonly talked of "putting their potatoes in hell for the winter" — a good way of preserving potatoes — for the word then meant merely A HOLE IN THE GROUND which was covered up — a dark and silent place — a grave. But pagan teachings gaining popular acceptance have caused people to apply to the English word "hell" the FALSE MEANING which came out of the lurid imaginations of Dante. Note, too, that the Greek word tartaros, which has also been translated into the English word "hell," occurs only once in the New Testament (II Pet. 2:4) and does not refer to humans, but to the restrained condition of fallen angels. Its meaning, translated into English, is "darkness of the material universe," or "dark abyss," or "prison." And what about "gehenna"? This Greek word represents "the Valley of Hinnom which lay just outside of Jerusalem and was the place refuse was constantly being burned up." Trash, filth, and the dead bodies of animals and despised criminals were thrown into gehenna. It was like some of our city dumps today, only on a larger scale. Ordinarily, everything thrown into this valley was destroyed by fire — completely burned up. Christ used it to picture the terrible fate of unrepentant sinners! But of the foregoing, remember this especially: In most of the passages of the New Testament where we see the word "hell" in our English Bible translations, the original Greek word was a different word than the word "gehenna." This other different word is the word "hades" — which does not refer to fire at all, but has an entirely different meaning. Yet the translators have used the one English word — "hell" — for these two entirely different Greek words that have TWO entirely different meanings! 1. Does Luke 12:5 contain the word "hell"? COMMENT: You can plainly see that this verse does have the word "hell" in it. Were you to look up the original Greek word that is here translated into the English word "hell," you would find it to be gehenna. "GEHENNA"
MEANS A PLACE OF PUNISHMENT, and Christ indicated this would be carried out by fire! 2. But now notice the same English word "hell" in Acts 2:31! COMMENT: To read the English translation of these two scriptures — Luke 12:5 and Acts 2:31 — it would seem that the word "hell" has the same meaning in both. But the original Greek word which is translated by the English word "hell" in Acts 2:31 is hades. "Hades" means "grave"! We can plainly see that the English word "hell" can have different meanings! So when we come to the word "hell" in our New Testament, we must carefully distinguish whether it is speaking of punishment by fire, or of the grave where the dead lie quietly buried. These two vastly different meanings for the word "hell" we MUST CONSTANTLY KEEP IN MIND when we see the word "hell" in the New Testament. When you see the word "hell" in your Bible, look it up in an exhaustive concordance, such as Strong's or Young's, if you want to know its true meaning. When a sinner dies, what happens to him? When he is interred in his grave, does he lie quietly and silently there, knowing nothing and awaiting the RESURRECTION? Or, at death, does his "soul" descend immediately into an inferno of eternal "hell fire" torture for his sins? 1. Do men and beasts all go to one place — the same place — when they die? Eccl. 3:19-20. You have never heard of beasts going to "hell" to be tortured, have you? 2. Does this same event — returning to one place — happen to both the righteous and the wicked? Eccl. 9:2. Then one doesn't go to heaven at death, and the other to hell, do they? 3. Where then do all go after death — back to the dust from which they were made? Gen. 3: 19. Does Eccl. 3:20 verify this? 4. Does Psalm 146:4 show that no one is able to think after he perishes? Are the dead unable to remember God? Ps. 6:5. Then all mental and physical processes of an individual come to a halt at death, don't they? How much do the dead know? Eccl. 9:5. Then isn't it true that a dead person has no more consciousness than a dead animal has? 5. What place does God say man goes when he dies? Eccl. 9:10. Did Job realize he would go to the grave after death? Job 17:13. Were worms of the earth to be his companions? Verse 14. 6. Must all people die at least once? Heb. 9:27. Does I Cor. 15:22 verify this? Did Christ take upon Himself the same mortal flesh of which we are composed? Heb. 2:14. And didn't He also have to go to the grave as all mortal men do? Acts 2:31. COMMENT: The original Greek word which has been translated "hell" in this verse is "hades" which, as you now know, means the "grave." Christ did not go down into a fiery hell, but merely into a grave. God does not sentence anyone to a fiery hell immediately after he dies, but merely to the grave. 7. Was Jacob, in speaking of his son whom he thought to be dead, certain he was already in a grave? Gen. 37:35. COMMENT: How overpowering the evidence is that the unrepentant sinner, or anyone else, does not go to a place of torment at death! They go to the grave, where they know ABSOLUTELY NOTHING! You have heard much preaching about people going directly to the fiery tortures of "hell" when they die. But have you ever heard of a judgment — a formal sentencing — of these people by God, before they go to their punishment? When and where do the dead go from their graves? Here's what your Bible reveals. 1. Is there to be a day of judgment? II Pet. 2:9. 2. Is it to be a time when the unjust are judged for punishment? Same verse. 3. When is this judgment to be? Heb. 9:27. COMMENT: It is plain that a person will receive final judgment from God at some time after he dies. 4. Is God able to bring people up alive from the grave? I Sam. 2:6. Does Rev. 20:13 prove there is to be a great future "resurrection to judgment"? COMMENT: Notice that those who are in their watery graves (the "sea") are to be resurrected; and those who are killed by other means and left unburied ("death") are to be resurrected; and those who are in earthy graves ("hell" — the Greek word here is "hades" which means the "grave") are also to be resurrected at this time. So all the dead on land or in the sea, wherever they may be, are to be RESURRECTED TO "JUDGMENT" IN THE FUTURE. No one is, or ever has been, down in a fiery "hell" dancing around on hot coals, shrieking in terror and torment! What is the penalty — the "wages," or reward — of sin? Is it eternal consciousness in torment, or is it eternal oblivion? Let's study further and see. 1. What does Paul warn will be the judgment of those who, knowing God's commands, wilfully sin against them? Heb. 10:26-27. Notice that this judgment comes on people because they sin wilfully. 2. And what is the "wages of sin"? Rom. 6:23. COMMENT: The "wages of sin is death"! ETERNAL DEATH for every part of you! "Death" is the opposite of "life"! 3. Does Jesus compare the false ministers to trees that don't bring forth "good fruit" — good works? Mat. 7:15-19. What did He say would happen to such people? Verse 19. Isn't wood put into a fire to be burned up? Did Christ say all people who do not bring forth good fruit will be cast into fire? Mat. 7:17-19, 23. 4. What did Christ warn would happen to those who do not repent of their sinful ways? Luke 13:3. Does "perish " mean to cease existing, or continue living? Look up the meaning in a dictionary. "Hell Fire" Will DESTROY — Not Just Torment! God has not decreed eternal life in torment for the incorrigible sinner! The punishment revealed in the Bible is eternal death — cessation of life forever. Eternal life is something we do not now have — it is a gift of God given at the resurrection to those that obey Him. Eternal life and eternal death are contrasted all through your Bible! Now notice what God says He will do with the sinners — the incorrigibly wicked on whom He has decreed, "The wages of sin is death" (Rom. 6:23). 1. Did Christ show by His parable of the tares that there was to be a future harvest? Mat. 13:30. COMMENT: In this parable Christ likened the earth to a "field" (verse 24), the obedient people to "wheat" (verses 25, 29), and the disobedient to "tares" (verses 25, 29, 30). 2. Did Christ say the evil people — the "tares" — will be BURNED? Mat. 13:30. 3. Does Psalm 37:20 also indicate the ultimate fate of the wicked will be destruction by fire? 4. Is there coming a time that will be extremely hot? Mal. 4:1. Will this time be so hot that it will burn — CONSUME — THE WICKED? Same verse. Since this heat consumes the wicked, no one will be left but the righteous, will there? 5. Will the righteous ultimately walk on the wicked? Mal. 4:3. In what form will the wicked be? Same verse. Who will burn the wicked up? 6. What did Christ warn the false preachers of His day — the Scribes and Pharisees — would be their fate? Mat. 23:33. COMMENT: The original Greek word translated here as "hell," is "gehenna" — meaning the Valley of Hinnom. Christ was referring to the fire that burned in the Valley of Hinnom as a type of complete destruction of the wicked by fire. Christ was thus asking these sinning ministers how they could possibly escape a COMPLETE DESTRUCTION BY FIRE such as they saw daily at the city dump, located in the Valley of Hinnom just outside of Jerusalem. 7. Isn't the Bible "hell fire" — gehenna fire which consumes completely those who are put into it — a lot HOTTER than Dante's "hell fire" which he believed to be only hot enough to torment? COMMENT: Yes! — thousands of degrees hotter! The Bible "hell fire" will totally consume the disobedient! Never will they exist again. This is a fearful warning to those who know God's truth and still refuse to obey it! "For the wages of sin is death; but the gift of God is eternal life through Jesus Christ our Lord" (Romans 6:23). If you believe this scripture means what it says, then you know the truth. But, unfortunately, most theologians and their blind followers try to twist and distort what Paul said into something else — to eternal life in torment. Could anything be clearer than this scripture? The wages, or reward, of sin is shown to be death, but eternal life is stated to be a gift from God — not something we already have. Death means just that — cessation of life and consciousness — total oblivion! In spite of the vain attempts of many preachers to make death mean separation from God, you cannot reconcile this with Scripture. Nor does death mean eternal life in the horrifying torments of an imaginary "hell." The false doctrine of a non-consuming, but only torturing "hell fire," which is used to frighten so many deceived human beings, is a preposterous LIE! Its author is the father of lies — Satan the Devil! (John 8:44.) If you are one who has been deceived by this doctrine, and are suffering mental torment because of it, MAY GOD HELP YOU TO UNDERSTAND THE TRUTH! And now comes a most interesting revelation! Of what does hell itself consist? Forget now all ideas you may have had as to what hell may be, and all that you have been led to believe it might be. Read now in your own Bible what God the Father reveals "hell fire" is going to be. For "hell fire" does not even exist yet! — astounding as that may sound. Here's the amazing truth from your own Bible! 1. If people persist in disobeying God, where did Christ warn they would ultimately find themselves? Mark 9:43-45. Won't they find themselves in "hell fire" — GEHENNA FIRE — a place of destruction? 2. Are whoremongers, murderers, liars, and such types — people who use the various members of their bodies, such as their hands, feet and eyes to disobey the commands of God — ultimately to find themselves in this "lake" of fire and brimstone? Rev. 21:8. COMMENT: A large fire often has the appearance of a fiery lake. That is why this colossal world-end fire is compared to a "lake" of fire! 3. Will it cause their death? Rev. 21:8. Which death will it cause? Same verse. COMMENT: All of us must die once, because we just "wear out" (Heb. 9:27), but if anyone dies the second death, referred to in Rev. 21:8, it is because that person has been judged guilty of persistent disobedience. The second death is ETERNAL death! 4. Does Rev. 20:13 verify the fact that the evil will be cast into this coming lake of fire only after the coming judgment? 5. Will all mortals NOT written in the book of (eternal) life be cast into this lake of fire? Rev. 20:15. COMMENT: Here is God's — not man's — but God's description of what "hell fire" will be! It is yet in the future, having never occurred before. And nothing is said anywhere in the entire Bible about descending beneath the earth into this final "hell fire," or of torture for all eternity! Rather, the Bible shows destruction for all eternity of all unsaved human beings who shall be cast into this lake of fire. All contrary ideas have been handed down to us from paganism. 6. What is this "lake of fire" actually to be — our earth's surface burning up? II Peter 3:10. Are all the things man has created on this earth to be burned up along with those who will not have been born as spirit beings into the Kingdom of God? Same verse. 7. Is the lake of fire, into which the Beast and False Prophet are cast alive at Christ's second coming, a type of this great worldwide fire? Rev. 19:20. COMMENT: The small prototype "lake of fire" of Rev. 19:20, which will burn in the Valley of Hinnom at Christ's return, foreshadows the final lake of fire which will consume the entire earth's surface much later, making it a molten mass! 8. What is meant in Revelation 20:14 by the words, "death and hell were cast into the lake of fire"? COMMENT: The original Greek word, which is here translated "hell" is "hades," which means the grave. Only unrepentant sinners who refuse to obey God will be left mortal at this time. Since no other mortal human beings will be born after this time, there obviously will be no one else who could die. Therefore, death and the grave will cease completely when the lake of fire engulfs the entire earth to DESTROY the incorrigible wicked, and cleanse it of all that pertained to mortal mankind. 9. What will be Satan's part in this coming "hell fire"? Rev. 20:10. COMMENT: Satan will be cast into the same conflagration that will destroy the wicked mortal people. But since he is a spirit being, he will not be touched by this flame (Luke 20:36). Notice the word "are" in the phrase "where the beast and false prophet are" (Rev. 20:10). In some Bibles this word is in italics, which shows it was added later by the translators. This word is not found in the Greek manuscripts. The phrase should read, "where the beast and the false prophet were," for these two mortal individuals — the coming great military and religious leaders — will long since have been destroyed by the time Satan is put in this flame. "Hell Fire" — "Never Be Quenched"? 1. Did Jesus speak of unquenchable fire in Mark 9:43-48? Was He speaking of "gehenna" fire? Notice that the Greek word for "hell" in verses 43, 45 and 47 is "gehenna." COMMENT: Jesus repeated five times for emphasis, that this coming "hell fire" (gehenna) which shall destroy the wicked, would never be "quenched." But the vast majority of people have carelessly assumed that the phrase, "go into hell, into the fire that never shall be quenched" (verse 43), is just one more proof that an eternal, tormenting fiery hell for the wicked has been roaring continuously underground, and will continue forever. Notice now God's own inspired explanation of unquenchable "hell fire." Christ constantly used the Jerusalem refuse or garbage fire, that burned in the Valley of Hinnom which bordered Jerusalem on the south, to illustrate the final "hell fire" — the final "gehenna fire" which is to occur at the time of the future purification of the earth's surface. refuse, and that it was only after they had accomplished this purpose that they burned themselves out. But they never were quenched, or put out, prematurely by anyone! The flames merely died out when they had nothing more to consume. It could have been said of these fires, "They shall not be quenched by anyone." They didn't have to be! So Jesus used the fire in the Valley of Hinnom, which wasn't quenched by anyone, as a TYPE of the great future worldwide gehenna "hell fire." 2. Now we'll let the Bible further interpret the meaning of "unquenchable fire." Did God, over 2500 years ago, warn the wicked inhabitants of Jerusalem that He would kindle a fire in Jerusalem's gates which would devour the palaces? Jer. 17:27. Did God say this fire "shall not be quenched"? COMMENT: This fire did occur a few years later and it did destroy all the houses of Jerusalem (Jer. 52:13). Since God said no person or thing would quench this fire ("it shall not be quenched"), and since it is not burning today, it obviously went out by itself after accomplishing its purpose! 3. And now for another example. What punishment befell the notorious cities of Sodom and Gomorrah? Gen. 19:24. Was it literal fire that destroyed human beings? Luke 17:29. What do we read in Jude 7 about this event? Did they have to "suffer the vengeance of eternal fire"? Is there still a fire burning in those cities which God set aflame long ago and destroyed? Of course not! COMMENT: "Eternal fire" means a fire whose results are permanent or everlasting — not a fire that burns forever! Sodom and Gomorrah have never been rebuilt. The fires which burned these cities went out of themselves when they CONSUMED all combustible material! Clearly none of these scriptures can be used to show that "fire that shall not be quenched" will torment people forever and ever! 4. Now try this experiment. Get a pan and place some paper in it. Now strike a match to the paper. Notice how it burns. What happens to the fire after it consumes the paper? It goes out! Did anyone "quench" it? Of course not! Notice that only ashes are left. 5. Are the wicked to be reduced to ashes by the final earth's surface-destroying fire? Mal. 4:3. How can ashes be tormented forever and ever? Then the "wages of sin is DEATH" by a reduction of the sinner to ashes, and is an eternal — everlasting — punishment, and not an everlasting punishing by torment, isn't it? COMMENT: Punishing is a continuous action. Punishment has a time limit! God is merciful! 6. Does God promise the righteous a better world after this one is purified by fire? II Peter 3:13. God Is Love — and Justice! The primary reason so many men and organizations of men have a false conception of "hell" is that they view the doctrine of hell just as an isolated doctrine. They fail to UNDERSTAND the overall purpose of God in putting man on this earth, of offering him the choice of receiving the gift of eternal life, if he obeys, or everlasting punishment (not punishing) for disobedience. God created man in His own image and likeness (Gen. 1:26). In the Garden of Eden, He instructed man in the way that would lead to eternal life. Then He told man that doing the wrong thing — eating of the fruit of the tree which God had forbidden — would lead to death (Gen. 2:17). But Satan, the FATHER of all lies (John 8:44), told the woman, "Ye shall not surely die" (Gen. 3:4). He told her she had an "immortal soul"! And man has been believing that lie ever since! God's purpose is to develop holy, righteous character in man which will make man fit to receive eternal life. God gave ancient Israel His commandments, "that it might be well with them, and with their children for ever" (Deut. 5:29). God created man in His own image in order that man might develop holy character so God could entrust him with the precious gift of eternal life. Notice that God offered Adam and Eve life on one hand, and death on the other. If an individual rebels against God, is unrepentant and unteachable, then God knows he would also ABUSE ETERNAL LIFE! If given eternal life while in this sinning condition, he would bring misery on himself and others for all eternity by his wrong ways. Certainly the KINDEST THING God could do is NOT give this person eternal life! The gift of eternal life for obedience — and the reward of death — eternal death — for disobedience are stressed all through your Bible. Only this is consistent with the Scriptures, and with God's plan and purpose — and His character of supreme love! God will not, because of His infinite love, take away anyone's life because of ignorance or weakness, but only if they wilfully and knowingly refuse to obey their Creator. The warning of "hell fire" should be a FEARFUL WARNING to those who know God's truth and still stubbornly refuse to obey it! It should bring the somber realization that unless we surrender to God's will and His way of love, and ref use to let anything turn us aside, God will take away forever the life He has given us! A startling statement is found in Mark 9:44, 46 and 48. In these verses of Scripture, Christ spoke of a worm that "dieth not." Who ever heard of the immortality of worms?! Some people think that Jesus was referring to people as worms and was trying to say that these "people" never died — but lived on in agonizing torment. Those who say this fail to notice that Jesus does not call the wicked people "worms," but instead speaks of their worm. A similar statement is made in Isaiah 66:24 in which "their worm" refers to the "worm" of the "carcasses." Since it is the "worm" of the wicked, then the wicked themselves cannot be the "worms." The Lexicons define the Hebrew (Isa. 66:24) and Greek (Mark 9:44) words translated "worm" as a grub or maggot. If anything, especially a dead body, landed on a ledge above the garbage fires of "gehenna," it would be devoured by many worms or maggots which were kept alive by the animal and vegetable substances deposited there. It was to these worms that Christ was referring when He said, "their worm dieth not." But Christ didn't mean that each individual worm continued to live forever! Actually, these maggots come from eggs deposited by flies. Here is the cycle. These eggs give rise to larvae — maggots — which eat flesh and other garbage. They continue in this form a few days, then go through a change called pupation, and finally emerge as flies. The worms don't die — they become flies! These are scientific facts, known by any real student of science. And yet some people think that Christ ignorantly stated that these larvae continued to live forever in that stage of development! This just goes to show that we should always be careful to use wisdom and common sense in studying God's Word. The Holy Spirit is the spirit of a sound mind (II Timothy 1:7). Let's rightly use the minds God gave us! The Greek word which was inspired, and translated into the word "worm" in Mark 9:44, simply means a grub or maggot, and is a collective expression — like "fish" or "deer" — for worms that devour dead matter. These worms do not die, but pupate and become flies. Later, these flies, like all other creatures, will return to the dust from which they came. "All are of the dust, and all turn to dust again" (Eccl. 3:20). In Isaiah 66:24, we again find that the inspired word simply means a common grub or a maggot. These worms or larvae also feed on the dead bodies for a few days, and then emerge as flies. Thus, these worms "die not" but continue to develop into flies just as any normal, healthy maggot! The flies continue to deposit their eggs only as long as there are dead bodies or other matter for the larvae to feed on. How utterly ridiculous and laughable is the idea that worms have immortal souls! Eccl. 3:19 shows that no living creature is born with an immortal soul. Let's live by God's Word so we may receive the gift of eternal life, and not the wages of sin which is death (Rom. 6:23). This death will come by a fire which God will not permit to be quenched — but will burn itself out by consuming this earth's surface, and all of the wicked who will then become nothing but ashes (Mal. 4:1). Jesus' parable of Lazarus and the rich man (Luke 16:19-31) is perhaps one of the most if not the most — outstanding texts used by those who seek to prove there is a fiery hell in which the wicked are suffering excruciating torture today. Exactly what did Jesus intend to illustrate by this parable? Let's get the facts straight! 1. Did Lazarus — a poor but righteous beggar mentioned in this parable — DIE? Luke 16:22. Was he carried by angels to "Abraham's bosom"? COMMENT: God gave Abraham and his "seed" the promise of the earth for an eternal inheritance. If we are Christ's, we are considered by God as Abraham's seed — children — and are thus also heirs with Abraham to receive this promise (Gal. 3:29). Through faith we may all become "children of Abraham " (Gal. 3:7). This is an INTIMATE RELATIONSHIP — a close or bosom relationship — to Abraham. We are to be in close contact with him in sharing this promise. It is like being taken to Abraham's bosom (Luke 16:22). And so righteous Lazarus was taken to Abraham's bosom in this parable. When, then, did Abraham actually receive these promises? The startling answer of Scripture is — HE DIDN'T! — he has not, even yet in our day, inherited these promises! We learned in Lesson 13 that Abraham will inherit the promises at the resurrection of the just, when Christ returns to establish the Kingdom of God on earth. And what about Lazarus, the beggar of Jesus' parable? He, being intimately related to Abraham, spiritually speaking, will also receive the promises when he is resurrected at that same time! Lazarus is a type of Abraham's children who are to receive the promises at the resurrection. 2. But what about the sinful rich man of Jesus' parable? Did he also die? Luke 16:22. And is the next picture we see of him one where he is lifting his eyes from the grave — not from a fiery hell of eternal torment — but the grave, and calling to the resurrected Abraham for a few drops of water to cool only his tongue, being in mental torment? Luke 16:23-24. How could he lift up his eyes unless he were resurrected? COMMENT: The word "hell" used here is translated from the original Greek word hades, which you know means the "grave." It is not from the Greek word gehenna, which represents the future lake of fire that will destroy the wicked forever. The rich man, at this moment, is pictured as coming up out of his GRAVE through a resurrection. When Christ comes, the righteous will be resurrected to immortality, and Christ will say, "Come ye blessed [who are here Abraham and the beggar] inherit the kingdom prepared for you..." (Mat. 25:31-34). Abraham and Lazarus will have escaped, through the sacrifice of Christ, the judgment of eternal death by "hell fire" — they will have been immortal for over 1000 years BEFORE the rich man is resurrected to be burned in the lake of fire (Rev. 20:15). Until then, he has been dead in the grave having no recollection of the passing of time (Eccl. 9:5). But at his resurrection from the grave, the rich man sees the flames of the lake of fire surrounding him, which he knows will DESTROY HIM FOREVER. Being in great mental agony, he asks for just a little water to cool his tongue which has become dry from his mental anguish. He does not ask for buckets full of water to put the fire out. An impossibility, he knows. 3. What will Abraham then answer the rich man? Luke 16:25, 26. COMMENT: The great gulf between the two will be the difference between mortality and immortality. Those who are made immortal shall never die because they will be born of God (Rev. 20:6). Abraham and the beggar will be on the immortal side of this gulf — the mortal unrighteous rich man on the other, facing eternal death by fire. How clear that the PARABLE of "Lazarus and the Rich Man" DOES NOT PROVE ETERNAL PUNISHING by God! Rather, by this parable, Christ was preaching the Good News of SALVATION!! He was picturing the resurrection to eternal life and the inheritance of the Kingdom of God on this earth forever. Christ was also picturing the alternative of eternal life — ETERNAL DEATH in the lake of fire — if we don't accept the Good News of how we may be saved, and ACT upon it!